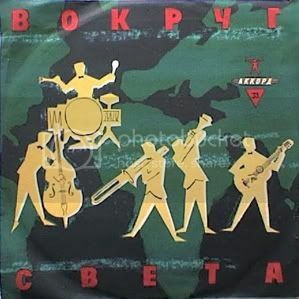 This is a collection of 50's/60's instrumentals from "around the world" as included on flexi-disc in Вокруг Света, the Soviet Union's version of National Geographic from back in the day. Thanks to Yury for providing the info in the comments, I had it all wrong. Вокруг Света (Around The World) was Soviet (now Russian) magazine similar in concept to National Geographic. Some issues of the magazine had flexy disks inside. This collection is compliled from the magazine disks. The music on the disks was not of Soviet origin; quite the contrary, that was music from various foreign countries around the world. Two tracks listed are Les Paul - Tico Tico and some piece by anonymous Peruvian orchestra. Was it subject to censorship? Listening just now and loving it. Any possibility of a track listing? My chars are all garbled. The posted mp3s look better (cyrillic).